Congratulations to our Client 1 Voice for their feature on The Doctors. 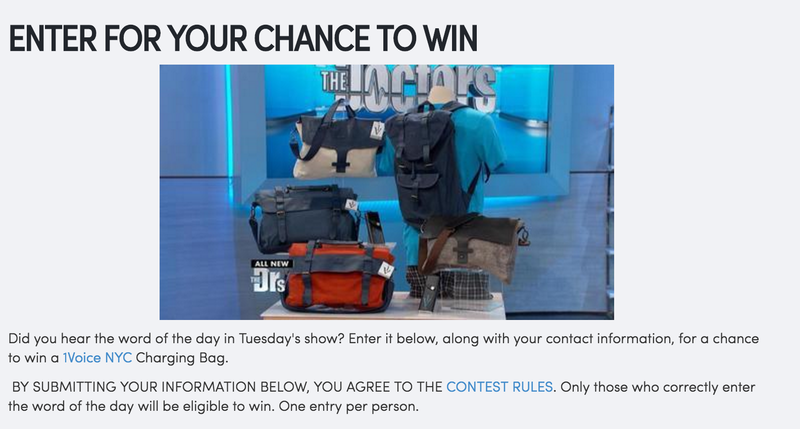 If you heard the word of the day on this past Tuesday’s episode of The Doctors, then you could win a charging bag from 1 Voice. 1 Voice makes the latest in wearable tech. Their bags are built to keep you charged anywhere — even on the go. Never fret about forgetting your charger again — at work, crashing at a friend’s, in a foreign city, or on your commute, you’re now empowered to stay effortlessly in touch. Head here for your chance to win and find out more about 1 Voice at 1voicenyc.com!